This online exhibition was created with generous support from the United Engineering Societies Foundation. The website is based on materials from the A.B. Nichols Panama Canal Collection that were featured in the Library’s gallery exhibition, The Land Divided, The World United: Building the Panama Canal, April 8 to December 31, 2014. It offers visitors a brief history of the building of the Canal as seen through the eyes of A.B. Nichols, who amassed his collection of 1,200 original photographs, 1,300 blueprints and schematics, 100 maps, 250 letters and memoranda, and other items including diaries, postcards, news clippings, and hand-colored sketches and drawings throughout his ten-year tenure at the Canal. He added his own comments on events as they happened and added depth to the collection with cross-references that connect various pieces of the collection. Auren Bugbee Nichols (1845-1929) was born in Charlton, Massachusetts, and served as Office Engineer during the Panama Canal’s construction. 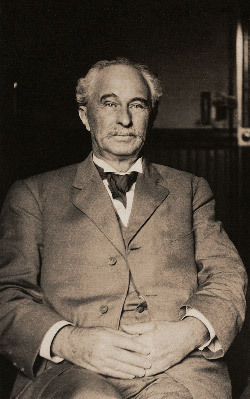 A graduate of Brown University, Nichols worked as a railroad engineer in the northeast before joining the Isthmian Canal Commission in Panama in 1904. In 1937, Tirzah Nichols donated her father’s collection of original materials about the Panama Canal to the Engineering Societies Library in New York City. In 1995, the United Engineering Trust transferred the Engineering Societies Library’s holdings to the Linda Hall Library. Unless otherwise noted, images in this exhibition are from the A.B. Nichols Collection. Enrique Chaves-Carballo, M.D., University of Kansas Medical Center; James Flynn, M.D., Staff Pathologist (retired), Research Medical Center; Peter Hansen, Editor, Railroad History; Dee Harris, Exhibition Specialist, National Archives and Records Administration at Kansas City, Missouri; Michael Haverty, Former Chairman, President, and CEO, Kansas City Southern Railway Company; Dr. David Rogers, Karl F. Hasselmann Chair in Geological Engineering, Missouri University of Science & Technology; Dr. Kevin Truman, Dean, School of Computing and Engineering, University of Missouri-Kansas City; Allen Wrenn, Civil Engineer (retired), California Department of Transportation.